A few words on the soba noodles, because they are a critical component of this dish. Follow these tips and you’ll have perfect noodles. Most gluten-free soba noodles leave a lot to be desired in terms of texture. They tend to fall apart and turn to mush. King Soba brand are the exception. They are several different types made from various grains and vegetables. 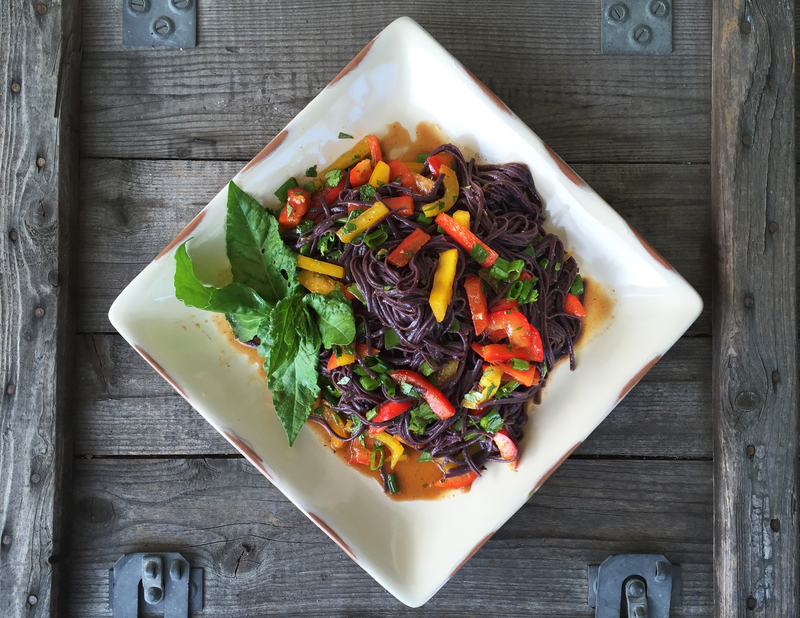 My personal favorite is the black rice noodles. You can buy them on-line through Vitacost or Amazon, or at a health food market. Take care not to overcook the noodles, or you’ll be contending with a ‘mushy noodle’ situation. I usually set the timer for a minute less than the package instructions call for, and then do the ‘bite test’. You’re looking for al dente (cooked so as to be still firm when bitten). After draining them in a colander, briefly run them under cool water and drain thoroughly. Pour half on the Sweet Ginger Scallion Sauce in a large, wide mixing bowl and then dump the rinsed, drained noodles into that pond of sauce and pour the remaining sauce on top of the noodles. With your hand (yes your hands), gently combine the noodles with the sauce. If you use a mixing utensil, the noodles are more apt to break apart. Feel free to add or substitute veggies, based on what you like or what you have on hand. Bok choy, snow peas and bean sprouts would all be great additions. 1. In a small mixing bowl, whisk together the ingredients for the Sweet Ginger Scallion sauce. Alternatively, combine all ingredients in a glass jar and shake to combine. Set aside for the flavors to develop. 2. Cook noodles according to package instructions. Set the timer for a minute less than the package instructions call for, and then do the 'bite test'. You're looking for al dente (cooked so as to be still firm when bitten). 3. While noodles are cooking, slice pepper and grate carrots. 4. Drain noodles in a colander, briefly rinse under cold water. Shake out all excess water. 5. Pour half on the Sweet Ginger Scallion Sauce in a large, wide mixing bowl and then dump the rinsed, drained noodles into that pond of sauce and pour the remaining sauce on top of the noodles. With your hand (yes your hands), gently combine the noodles with the sauce. If you use a mixing utensil, the noodles are more apt to break apart. 6. Add veggies and sauce to noodles, then gently mix to combine.